The city of Dana Point, a coastal community south of Laguna Beach, was immortalized in the 1840 book "Two Years Before the Mast" by Richard Henry Dana. It has one of the few small craft Harbors, and is home to the Catalina Express, which transports visitors to Avalon, Catalina Island. The Harbor area includes many restaurants and charming shops. Recently, the center of town has undergone redevelopment with the introduction of "The Prado" - another restaurant and shopping area above on the bluff. Dana Point offers lovely ocean-view homes, each unique and different, in its "Lantern District", named after the varied lanterns ships used to identify their goods. 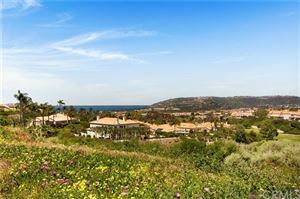 High-end home communities include Ritz Pointe, the Strand, Monarch Bay, Emerald Ridge and Monarch Bay Terrace ... many of which offer outstanding coastal views as well as close beach access. A golf cart is the preferred mode of transportation! Several hotel resorts including the Ritz Carlton, perched above Salt Creek Beach, and Monarch Bay Resort (formerly the St. Regis) make it also a tourist destination.